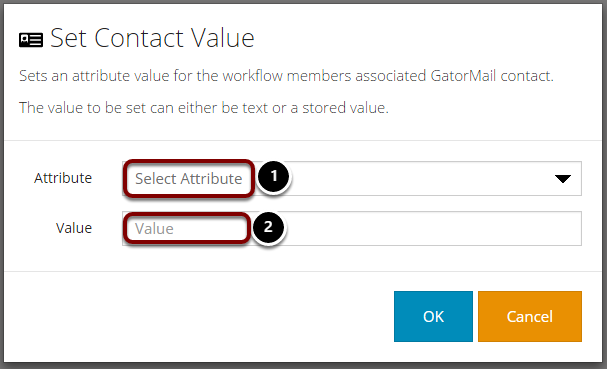 This stage updates a Workflow member's GatorMail contact record, setting a particular attribute's value. You could use this to set a member's Lead Score to a static number '100' or to the value of any other stored value (Dynamic). The below screen will appear on dragging the stage to the canvas. Select the attribute to update in the contact record. Set the value. This could be a static string or you can set a stored value by using it's name. For more information on Stored Values please see Using Stored Values.